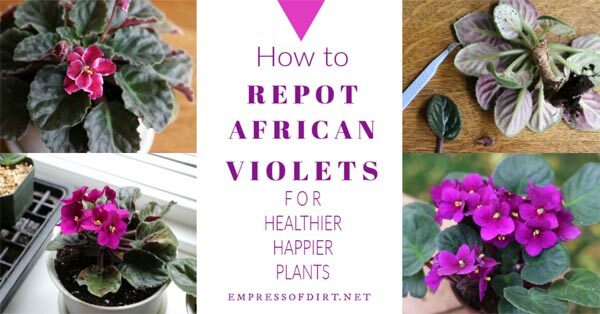 African violets are easy-to-grow houseplants, but they do need repotting once or twice a year to prevent the plant from overgrowth. I’ll give you some tips for cleaning up leggy and crowded violets. 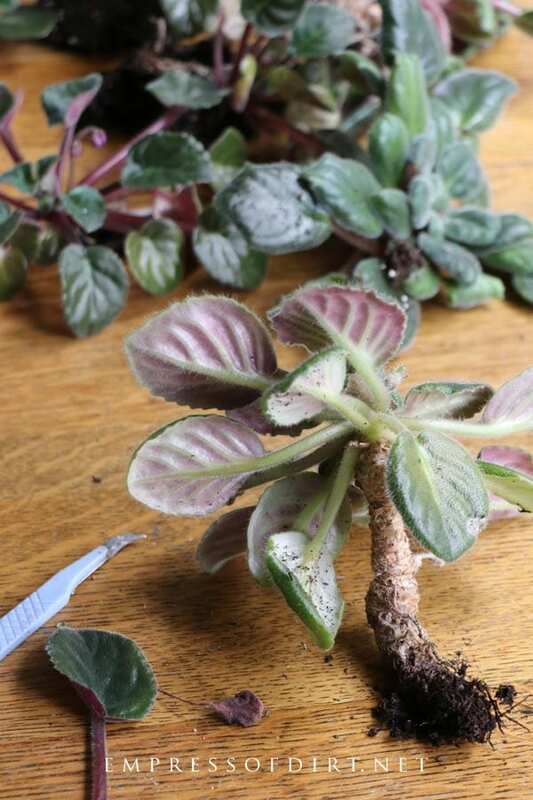 If you are repotting, it’s also a good time to take leaf cuttings from your African violets and propagate new plants. Houseplant trends come and go, but African violets seem to maintain a steady, sentimental fan base. I find their bold colours and simple arrangement so cheerful, particularly during the colder months. While they are, overall, easy to care for, African violets can get out of hand if their size and form are not maintained on a seasonal basis. This involves grooming the plants—removing unwanted leaves and trimming crowns—and repotting as needed. Unlike many other houseplants, repotting may not require a larger pot. 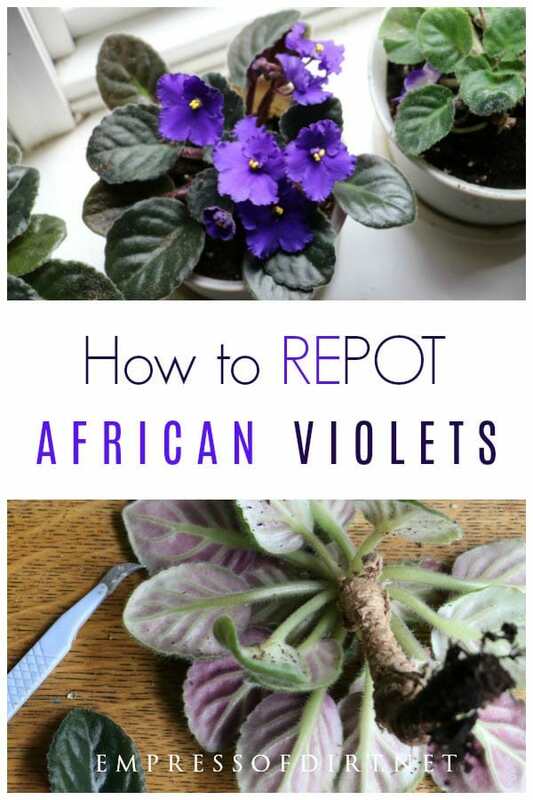 Many African violets are bred to remain small and like a compact container, so repotting is often a process of cleaning up the plant and refreshing the potting mix, not up-sizing the pot. Before we talk about repotting violets, here’s a few basics for successful growing. Sunlight | East or west windows are recommended. Avoid excessive heat and cold. You’ll know the light is insufficient if the plant doesn’t bloom, the leaves grow in elongated shapes, or crowns get leggy. Fluorescent Lights | One foot above the plants, 12-14 hours per day. 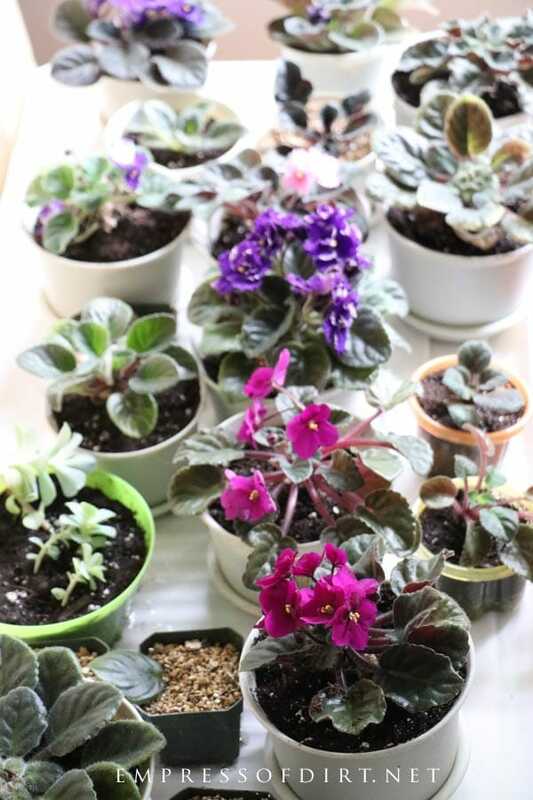 Soil | Use a commercial mix intended for African violets combined with perlite, or make your own. Water | Water deeply, until the saucer fills. Empty the saucer after 30 minutes. Best to water from below and avoid leaves. Also consider wick watering. Humidity | 40-50 percent | I keep some of my violets sitting above plant trays filled with water. When the air is too dry, I set clear bags over them (never touching the leaves). Pot Type | Plastic or clay. I love clay but I find it dries out too fast in the warm sun. These plastic ones have good drainage and saucers. Fertilizer | One popular type used is Better Gro Orchid Plus 20-14-13. I use fish emulsion. Ask at your local garden nursery to see what they recommend in combination with your local water. A neighbour gave me about a dozen old African violets and I was happy for the gift although I knew it would be a challenge. They were pretty messed up! This next photo is a prime example. See how there are all different clumps growing together? This plant is so chaotic, it not only looks like a hot mess, but it will probably not bloom either. But I still want to give it a chance. Many years ago, it likely started out in good formation, with symmetrical leaves nicely circling the middle of the pot. But, after years without repotting, the whole thing has become a happy monster. I’m sure the owner water it perfectly but did not repot it as needed or watch out for rogue growth. Without regular care—once every 3-6 months or so—these guys can grow in all sorts of crazy ways. After several years, it gets very hard to fix them without serious cutting back. African violets are fairly fragile and it’s a bit too easy to break leaf stems. 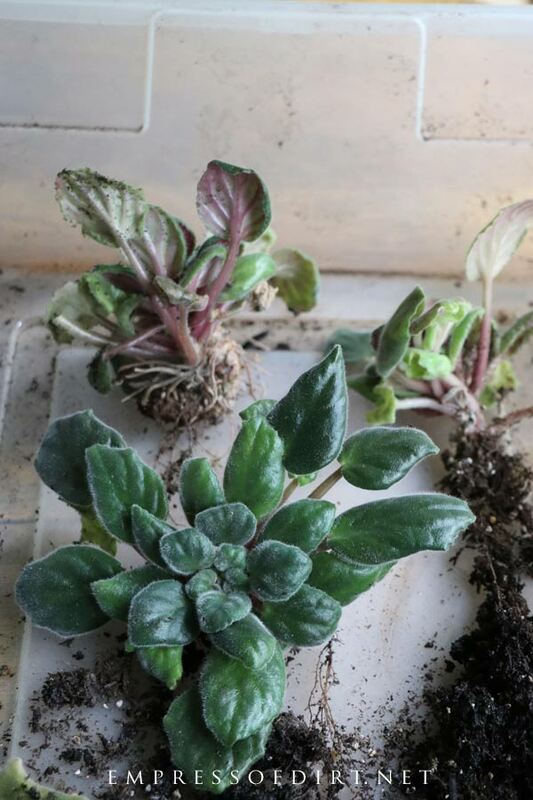 Before repotting, it is recommended to water deeply—until water runs out the bottom of the pot—and empty the saucer after 30 minutes—a few days ahead. This moisture infusion can prevent some unwanted breakage of leaves while handling the plant. Looking underneath, I found several crowns and suckers, as expected. This plant is such a mess, that I am going to be ruthless to get it back on track. I’d rather end up with some small new plants with good healthy formation, then continuing this crazy mess. A lovable, crazy mess, but, a mess. Also, any healthy leaves removed can be propagated to create new plants. 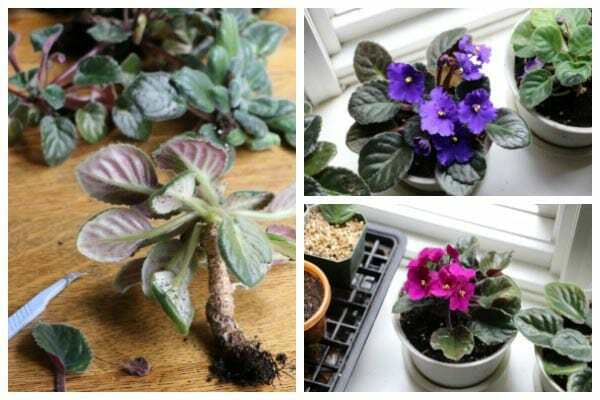 See How to Grow African Violets from Leaf Cuttings here. You could get a lot of new plants from this one! From top view, starting with the outermost leaves, I remove any dead or damaged ones, as well as any growing in strange places or in odd directions. The goal is symmetry, but this may be impossible if your plant is so seriously overgrown like the ones here. Sometimes this means removing most of the leaves. Ideally, I end up with about 10 total in nice, circular formation, but, in reality, it could be down to just half that. Again, go for long-term health. This is not the time to fear a good grooming. 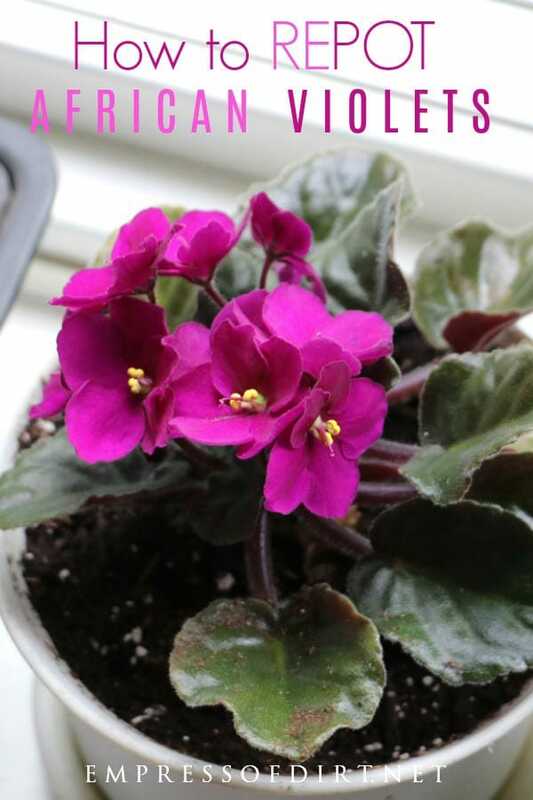 A properly-planted African violet has its lower leaves just a quarter or half-inch above the soil (potting mix). It’s very common for the plants to get ‘leggy’, with the crown (thick, main stem) getting woody and tall, extending several inches above the soil. Just like succulents that are stretching for light, these crowns can get pretty gnarly and bent. In this next photo you can see a leggy crown. To get this one back on track, I’m going to cut off the crown about 1-2-inches below the lowest leaves. 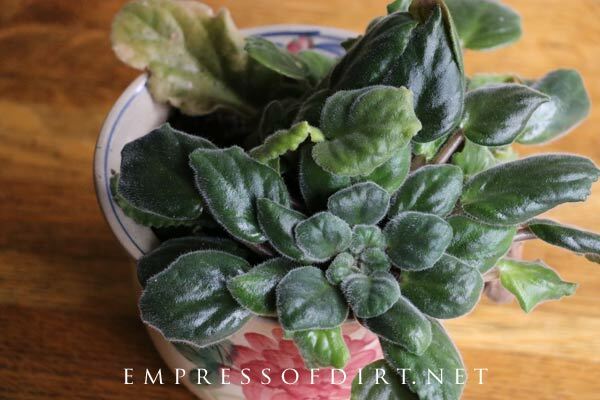 If it looks green and healthy inside, I will gently scrape the woody surface off with a clean, dull knife, and then plant the whole thing in a combination of damp African violet potting mix and perlite. If it’s rotting inside, I’ll keep cutting until I’m confident I’ve got a rot-free section. 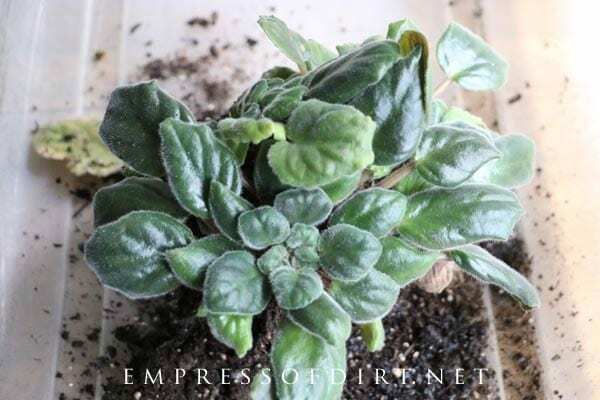 If the African violet has roots but no crown, or no excessive crown, I will simply repot it at the recommended depth, again with the lower leaves one quarter to one half-inch above the soil (potting mix). African violets like their roots fairly compact. Often, you will not need a larger pot size after cleaning up the plant. The small breeds can spend their entire lives in a 4-inch pot if they are properly maintained. If you are simply repotting because the plant is growing, it’s best to just increase the pot size by 3/4 to 1-inch maximum at a time, and only if warranted. If you are repotting overgrown plants you have separated into smaller, individual plants, a pot that is the width of root base or crown plus two inches in diameter will be fine. Choose pots that are as deep as they are wide, but not deeper than that, if you can. I have a terrible time finding pots I like in the right sizes, but finally settled on these ones. My neighbour’s crazy, old plants were pretty tricky to clean up and repot, and they are certainly never going to win any beauty contests, but they are still lovely plants and will provide lots of blooms for years to come. For optimum growing conditions. you can set each newly repotted plant in a large ziplock bag and close it up, to keep humidity in, just the way they like it. Use a bag big enough that the leaves don’t touch the sides, otherwise they may be exposed directly to the condensation, which they don’t like. A humidity cover is particularly beneficial at times like this after transplanting when the plant has been stressed and needs to recover and regrow. In addition to your watering and fertilizer routine, do yourself a favour and check on the structure of your violets every couple of months. In addition to repotting as needed, take care of odd leaf growth, crowns sneaking up, and suckers. This will give you better-looking, healthier plants. How Often Should I Water my Houseplants? I have 2 I repotted last year and they have not rebloomed. Have dropped some lower leaves and are very long root stem. Do I drastically cut that &repot? Hi Linda, It sounds like there could be several issues there. I’d go over the list of best growing conditions (listed above) and determine what’s missing. At this point, if the stem is long, I would cut it down and repot. And then see if you can provide even watering, adequate light, humidity, and warmth going forward. All the things!